I have mentioned before that when I make cards I usually make 13. It seems rather odd and I am not sure why exactly that number. Well, recently I found out that I do the same with watercolors ( the small ones I mean).I can do up to 13, no more, no less in one sitting. Well, here are some of my latest watercolors. The size of all is 8/10 with the frame. The actual painting probably is 6/8 ( I haven't measured it). Please, have in mind that I've been painting with watercolor only 2 months and I have a lot to learn. 1. 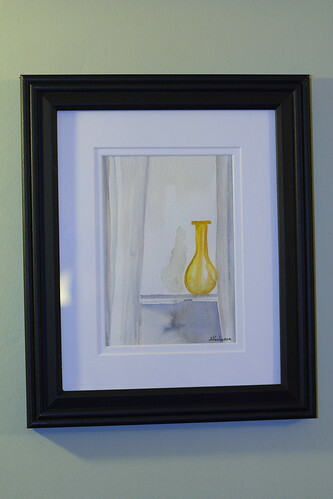 Watercolor " Window" in blue and gray with orange vase. I should probably mention that I don't draw sketches with pencil before I apply the watercolor. This is difficult for me to master yet, but I am trying. I try mostly because I don't like how the pencil shows under the watercolor, but also because I change ideas in the process of painting. 2. 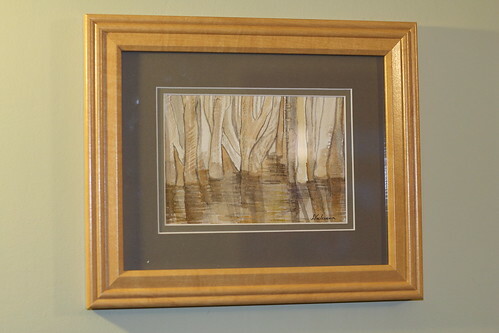 Watercolor " Trees" my first attempt at painting water that is not blue. 3. 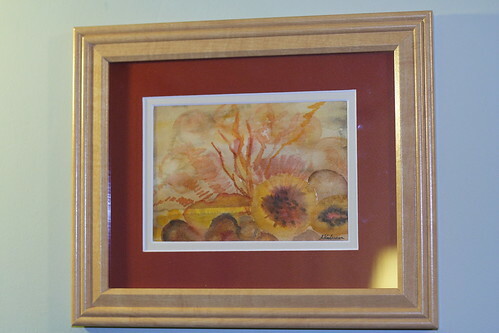 Watercolor "Warm" in orange and red. 4. 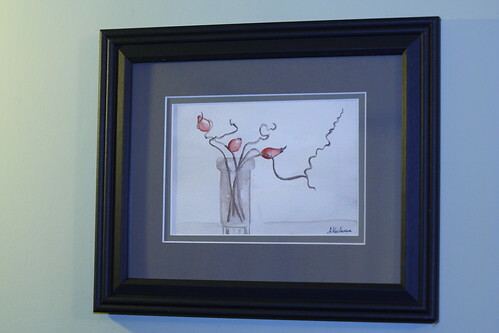 Watercolor " Briar in a vase"- this one has a smaller version that I couldn't fine a frame for, but maybe I'll take a picture only of the watercolor itself. I'll post 5 more tomorrow. Let me know what you think, I am still in a process of learning and every opinion is very welcome. I can't decide if I should use any of these for the art show too. I would put them on the first (home page)! It is good to hear others' opinions though! I am glad you share what you think and I appreciate your ideas even more! Thank you! Ани, чудесни картини. Особено третата. Точно топлина се излъчва от нея. Много приятно му става на човек като я погледне. Едно слънчево и топличко.